NATURAL INSECTICIDES (insecticides, anthelmintics) for veterinary use in DOGS, CATS, HORSES and LIVESTOCK - cattle, sheep, goat, pigs, poultry. Natural ANTIPARASITICS compounds are specific chemical molecules, which occur in nature (mostly in plants) and show some kind of parasiticidal efficacy. "Natural" means that they are not of synthetic origin, although they may be more or less easily synthesized in the laboratory. Most such products identified so far show insecticidal and/or acaricidal effects, only a few ones act upon helminths. The natural origin of such active ingredients does not mean that all commercial products made with them contain only naturally produced active ingredients. Industrial manufacturing of several natural active ingredients can be done by extraction and purification of plant extracts, but also by standard synthetic processes. And most inert ingredients are not of natural origin any way. Such natural compounds (active ingredients) are not to be mixed up with natural plant extracts or essential oils which contain more or less well defined mixtures of several compounds. There are two major types of natural active ingredients: those produced by plants (trees, shrubs, grasses, etc.) and those produced my microorganisms (bacteria, fungi, yeasts, etc). Compounds produced by plants can often be obtained by simple (i.e. non synthetic), more or less sophisticated extraction out of vegetable material (seeds, leaves, bark, etc.) from plants that are conventionally grown and harvested for this purpose. 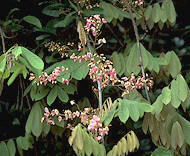 Many of these plants have been known for centuries and are used in traditional remedies in many cultures and regions. Compounds produced by microorganisms are obtained in large scale sophisticated fermentation processes where these organisms are multiplied, whereby genetically engineered strains may be used. The parasiticidal compounds are then extracted from such organisms. In contrast with the plants, such microorganisms were not known in the traditional medicine in the past and are usually not available for preparing home-made remedies. Only very few antiparasitic compounds of natural (i.e. non-synthetic) origin have such a "crushing" efficacy against veterinary parasites as most synthetic active ingredients. However, those available can be useful to handle light infestations or as alternatives to treat weak or young animals. In addition, there are a few inorganic compounds of mineral origin with certain insecticidal or anthelmintic properties. They are not produced by living organisms but can be manufactured from naturally ocurring minerals. These compounds are sometimes used as active ingredients in veterinary antiparasitics, but often also in the form of essential oils of various plant extracts that contain a more or less variable mixture of some of these and other natural compounds. These natural compounds or the corresponding plant extracts are often used in OTC (over-the-counter) "soft" antiparasitics such as shampoos, soaps, sprays, powders, lotions and the like for pets or horses, typically to protect them against fleas, mosquitoes, flies, etc. The use of such natural compounds on livestock is irrelevant. Nicotine: an alkaloid from the tobacco plant (Nicotiana tabacum) and other plants from the same family (Solanaceae, or nightshades) such as potatoes, tomatoes, etc. It was more widely used in the early XXth century. Ryanodine: another alkaloid, found in Ryania speciosa shrubs, whose powder is moderately used as a biopesticide in agriculture. Cevadine: another alkaloid, found in the seeds of Schoenocaulon officinale, an American plant. It is not used as an active ingredient (because it is rather toxic), but in plant extracts with a rather low content. Cinnamaldehyde: a component of essential oil from cinnamon (Cinnamomum zeylanicum). Copper: anthelmintic, very scarce use in livestock. It must be remembered that the natural origin does not guarantee at all that such compounds are less toxic than the synthetic parasiticides. They are as "chemical" as the synthetic ones. Toxicity is a matter of dose! But as a general rule, natural compounds are less persistent in the treated animals and in the environment than most classic synthetic parasiticides. The reason is that they are often sensitive to sunlight and/or are relatively quickly excreted, metabolized or otherwise broken down in the environment. Regarding their antiparasitic efficacy, a common feature of most natural compounds is that they are less potent, not as fast-acting and almost always less persistent than modern synthetic parasiticides. The only exception are abamectin, which is similar to ivermectin, a semi-synthetic compound, and spinosad. But what may be a disadvantage from the efficacy point of view can be a benefit from the safety point of view, e.g. in ecological production where the absence of residues (in meat, milk, eggs, etc.) is a key benefit. As a rule, products with such natural compounds are often submitted to a much looser authorization process than veterinary medicines regarding quality (e.g., specifications), proof of efficacy and safety. This is why there are so many brands: it is quite cheap to develop them. Many home remedies against veterinary parasites are based on recipes using medicinal plants that contain such natural compounds.